282 N. Skinker Boulevard, 314-696-8585. Mon.-Sat. 11 a.m.-10 p.m.; Sun. 11 a.m.-9 p.m. It took me a while to realize that if you put together the letters of Chris Sommers' flagship Pi with those of his latest concept 'Zza, they spell out "pizza." Admittedly, I can be a bit slow on the uptake, but after having dined at the new fast-casual pizzeria, I think there's something more to my failure than just being dense. A big fan of Pi, I've never considered it lacking in any way. The crust is impeccable, the sauce has just enough punch, and the liberal use of gloriously stringy mozzarella gives its pies so much goo you might think you're eating lasagna. It's a symphony of everything you'd want in a pizza and, if you factor in the great beer selection, a pizzeria. Sommers, however, recognized that something was missing — not with Pi's pies, but with his mini pizza empire in general. 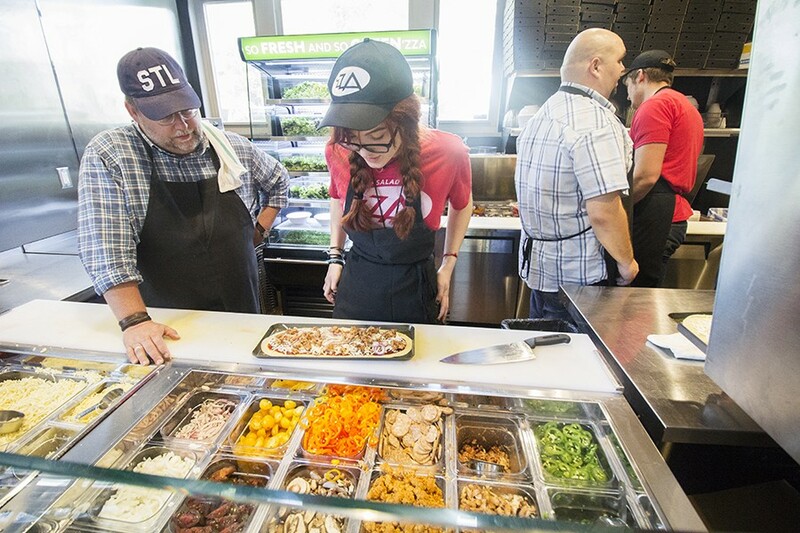 As he expanded the Pi brand across the country, his travels made him aware of just how white-hot the fast-casual market was becoming, especially in the pizza and salad genre. Why not take something he'd already had great success with and run with it in a different, on-trend direction? 'Zza's "Postrio" takes it flavor from Sweet Baby Ray's barbecue sauce, along with smoked gouda, red onion and cilantro. 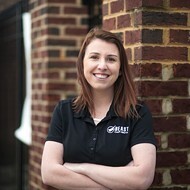 Sommers carried this nugget of an idea with him for a few years until he came across a special kind of high-heat convection oven that would allow him to offer fast-casual cook times without sacrificing the quality Pi had become known for. Once they had the ovens selected, he and Pi's chef Cary McDowell came up with an oblong-shaped cornmeal crust that pays homage to Pi's famous base, even while maintaining a uniform texture from the outside in. The firmness of the base allowed the pair to experiment with an infinite number of non-traditional toppings, and with that, 'Zza was born. Though the comparisons to Pi are inevitable, 'Zza is its own thing, a fact that becomes clear when you walk through the front doors. The sleek quick-service vibe is immediately apparent. A color scheme of black, red and white runs throughout the space, and a rust-colored concrete slab floor adds to the modern feel. A mix of communal, window and traditional four-person table seating is available for those dining in, though Sommers has put as much thought into the takeout side of the operation: Not only does 'Zza have a seamless online ordering system, but someone will run your order outside for curbside pickup so you don't have to deal with the annoyance of getting out of your car. 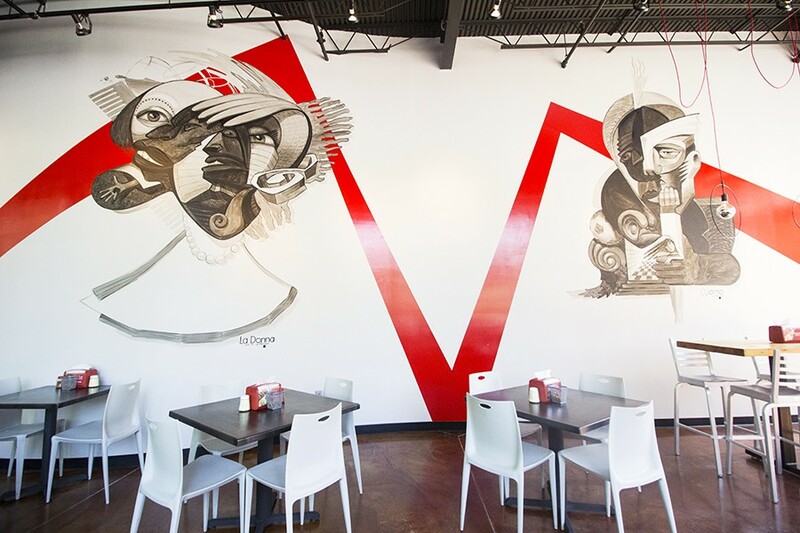 A striking black, white and red color scheme gives 'Zza's dining room a modern look. Not that you won't be rewarded for the efforts to find a parking spot: 'Zza serves seriously good pizza. There are lots of contenders to be the pizza version of Chipotle (new concepts spring up nationwide seemingly every night), but Sommers is ahead of the pack with the ideal thin crust, at once delicate and crisp, firm and chewy. It's a base that works well for simple varieties, like the classic margherita, which allows the bright tomato sauce to shine. Fresh mozzarella, basil leaves and a sprinkle of sea salt flakes make this a solid riff on the Neapolitan classic. Inspired by the time Sommers' wife Anne spent living in Rome, the "Rocket" is another nod to classic Italian flavors. Instead of tomato sauce, the crust is drizzled with olive oil and layered with fresh mozzarella, shaved Parmigiano-Reggiano and prosciutto. Olive oil and lemon-dressed arugula — enough that you could consider it a salad — tops the pizza, giving it a burst of bright citrus and peppery flavor. 'Zza has indeed captured the flavors of Italy on this one. 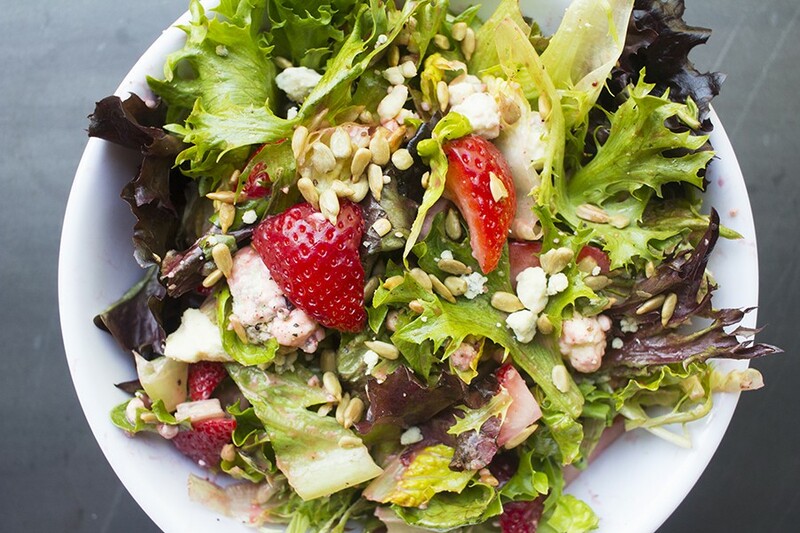 The "So Very Berry" salad is filled with fresh strawberries. Crossing the Ionian Sea, "Il Greco" is like summertime on a pizza. The combination uses olive oil, zucchini and blistered kumato and gold tomatoes as a stand-in for sauce, with a liberal garnish of feta cheese to add a pleasantly salty component. It's so simple yet perfectly done. I can't think of a better pizza option for that soon-to-be-scorching weather. 'Zza's light crust and garden's worth of veggies make me inclined toward the vegetarian options, but the meat offerings are just as successful. In perhaps 'Zza's biggest break with Pi, the "St. Louis Summer" uses both mozzarella and (gasp) Provel to cover its tomato sauce base. Hunks of spicy, fennel-studded sausage and jalapeño slices adorn the pizza for a satisfying, and decidedly hot, take on a classic sausage pizza. The "Thai Dye" captures key Thai flavors in a pizza, with a peanut sauce base and liberal use of garlic and cilantro. Sweet peppers and crushed peanuts add gentle heat and crunch, and tender chicken proves it is possible to put the meat on a pizza without having it dry out to jerky. I was skeptical about cheese being a part of that combination, but the pizza's mozzarella use is subtle enough to make it work, binding the components together with just a hint of richness. 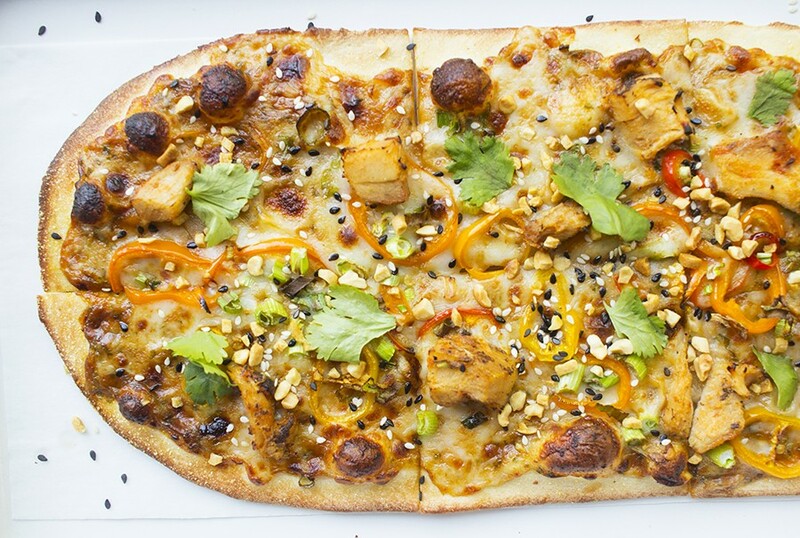 The "Thai Dye" features spicy peanut sauce, mozzarella, sweet pepper, chicken, peanuts, sesame mix, garlic and cilantro. 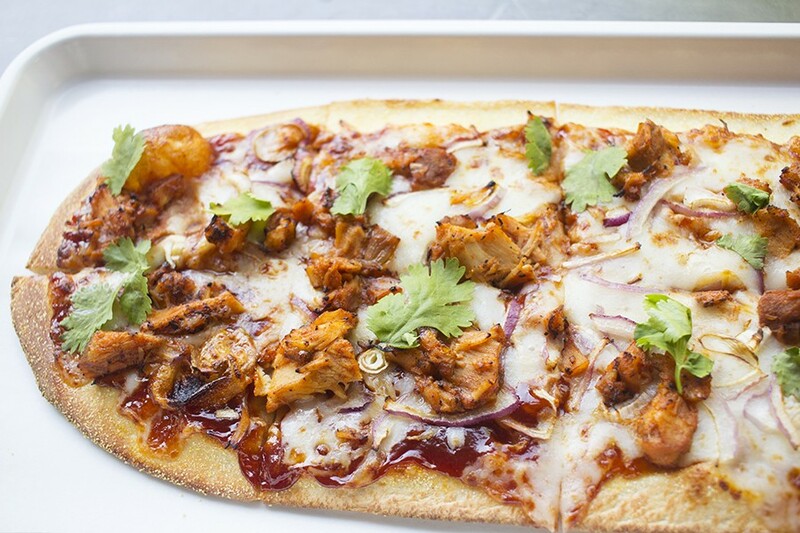 'Zza's "Postrio" shows why barbecue chicken became so ubiquitous in the modern pizza genre. Sweet and tangy barbecue sauce is topped with hunks of chicken (again, credit is due: These are a far cry from dried-out nuggets), red onions and cilantro for a refreshing pop, and Gouda cheese that picks up on the sauce's smoky notes. It sets the bar for the form. 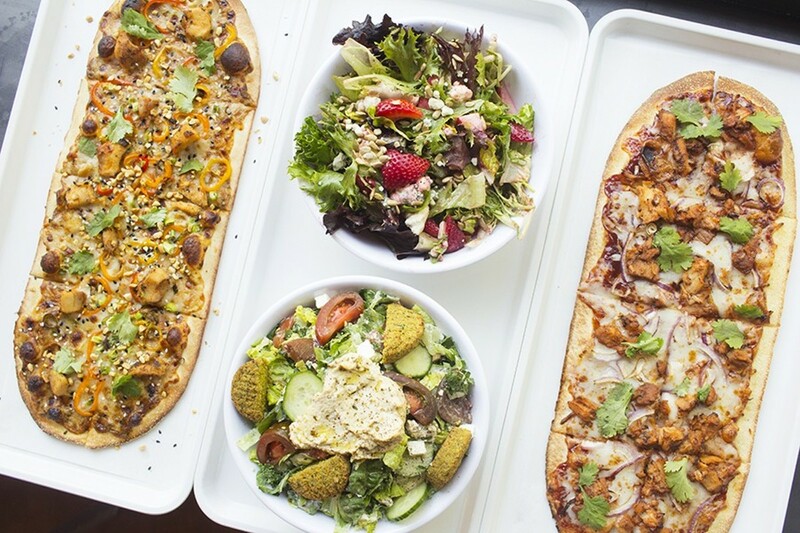 Though you wouldn't know it from the name, 'Zza is as much a place for meal-sized salads as it is for pizza. 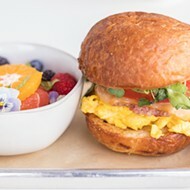 The "So Very Berry" pairs what seems like an entire quart of thick-sliced strawberries with mixed greens and fresh basil. Pecans and smoked blue cheese infuse the salad with deep earthy flavor, and though it was slightly overdressed, the berry vinaigrette brings everything together with a tart punch. 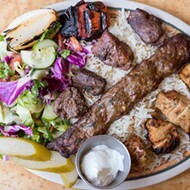 You could make two meals out of the mammoth "Zza-Lafel" salad — and you'd enjoy every minute of both. Kale and romaine serve as the base for what is almost a Mediterranean sampler platter in salad form. Large hunks of falafel, grilled chicken breast, tahini, red onions, cucumber and feta are wrapped in a silken yogurt dressing that is heavy with fresh mint. It's everything you want in a Mediterranean dish — except for a sea view. Chef Cary McDowell adds the finishing touch to "The Rocket." Perhaps my biggest surprise at 'Zza was the poke bowl, a seafood dish so thoughtful I can't believe it's coming from a fast-casual pizza joint. Giant cubes of watermelon-hued tuna are placed atop a salad of greens, nori, edamame, brown rice, quinoa, seaweed and thinly sliced jalapeños. A sesame-ginger sauce dresses the dish, and a sriracha mayo drizzle gives a pop of heat that evokes a spicy tuna roll. 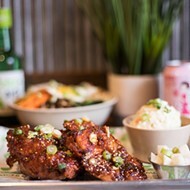 Sommers says the bowl was a late addition to the menu but has become its breakout hit. I can see why. If you'd asked me six months ago whether I wanted for anything more from Pi, I wouldn't have been able to get an emphatic "no" out of my pizza-stuffed mouth fast enough. Now that I've had that tuna poke — and that Greek pizza, and that "Zza-Lafel" — I realize what I was missing. Fortunately, Sommers did too. Now that he's expanded his repertoire with 'Zza, his pizza formula is complete.